Investing in affordable protection for your vehicle means prolonging the life of your vehicle. Our metal RV covers and carports are a durable solution that are customizable to your needs. You can upgrade or add to your RV covers/carports at any time. Trust your covering solutions, garages, carports and RV covers to our Hemet, CA based company. 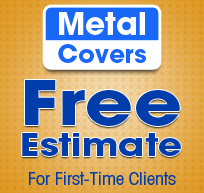 Metal Covers offers ideal work and storage spaces that you can customize for your home or workplace. Our metal buildings come in various sizes and amenities to create the perfect space for you. Contact us to learn more about our metal structures and the various customizable options available. Protect your vehicle and belongings from the elements with carports from the experts. At METAL COVERS we manufacture and install carports, RV covers, and metal buildings. All our buildings are 100% steel with a baked on enamel finish and "Cool Roofing and Siding" which complies with the green building code and California's Title 24 Energy Efficient Building Standards. Save time and money with factory-direct pricing and quality materials built in our warehouse located in Hemet,California. There is no added lead time for special sizes. All structures are built and installed by our factory trained professionals and usually can be completed in one day. Once we receive your order and a small down payment, you are building can be completed in two weeks or less. The balance is to be paid upon completion. You may pay by cash or check. We are licensed and bonded with the California State Contractor's License Board as well as insured. With more than 20 years of experience, we will provide you with quality materials as well as excellent customer service. All materials have a 40 year warranty and we warranty our labor for one year from date of completion.